Postcards from the Attic: An angelic creation! I thought I would share with you a card I made for a friend's little girl who is three. She loves all things girly and bling so I am hoping she will like this very lilac, very glittery card! 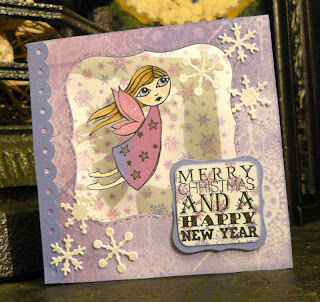 -The Sketch & Stash Challenge - it is loosely based on their sketch and the new stash is the angel stamp from PaperArtsy (this is the first time I have used it too). -The Papertake Challenge - no red and green - check! -And finally Stamp Something - theme glitzy; I think this qualifies as there is a lot of glitter and shimmer I promise, although not apparent from the photo unfortunately! This is just lovely and gorgeous colours too! Really cute card, great work. Thanks for joining the Simon Says Stamp Challenge.